Nari Niketan inmates borrowed a world of fragrance from flowers today. On a refreshing outing - their first in the past six years - to the Festival of Gardens, they brought home some splendid memories of roses in full bloom and of the Rose Garden which was their “paradise” today. Inmates of Nari Niketan are all smiles on their return from the Rose Garden where they went for their first outing in the past six years. Panchkula has the highest concentration of homosexuals and the second highest number of street children in Haryana, who face the risk of contacting the HIV virus. Rs 30 crore surplus budget of the Municipal Corporation has left councillors wondering as the Commissioner in a letter to the administration last year had shown paucity of funds with the corporation. Thirteen-year-old Reshu Jain was brimming with joy as she stepped out of the Fun Republic hall after watching Sanjay Leela Bhansali’s “Black”. Restless and panicky, the medically “hyperactive” girl didn’t know what way to react and who to talk to. The Deputy Commissioner, Mr Arun Kumar, today suspended the Sarpanch, Mr Om Parkash, and three panches, Kesar Singh, Darbara Singh and Rulda Singh, of the Mauli Jagran Gram Panchayat for their involvement in selling prime panchayat land of the village worth crores of rupee. When advice comes from a person who has seen the best of both the worlds, it no longer remains an opinion. And when it is someone who is recognised as one of the greatest scientists of our times, the comment should be taken with all seriousness and with sanctity. With the Punjab State Human Rights Commission not entertaining complaints of city residents citing territorial jurisdiction, woes of the victims of the human rights violations in Chandigarh seem to be unending. The Punjab State Human Rights Commission yesterday directed the SP here to look into the case of Phase VII resident who had alleged that a false complaint had been made against him and that he was abused by a police official. 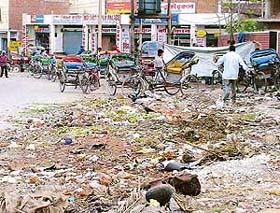 Protests by Municipal Councillors over poor state of sanitation in villages have fallen on deaf ears. Stench continues to trouble the residents of Attawa, Badheri, Burail and Buterla villages, under the Chandigarh Municipal Corporation’s control. As candidates brace themselves to know their performance at the hustings, they invoke blessings of the Almighty and make final preparations for the counting of votes for the Kalka Assembly seat. The HM Houses Welfare Association of Phase IV here has urged the police to check incidents of chain snatching in the town. Why govt officials go scot free? It is proper to take stern action against the management of Bhushan Industries after it was found guilty, but why no action has been taken against the officials concerned, officers of the departments concerned which have control over matters related to such factories. State of healthcare in the rural areas, including in Punjab, need to be improved so that common man can have access to better medical facilities. 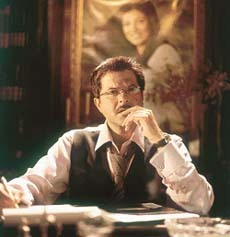 Principal Secretary to PM T.K.A. 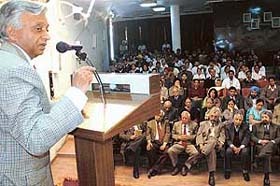 Nair speaks at a function held to pay tributes to a former PGI Director, Dr P.N. Chhuttani, in Chandigarh on Saturday. The General Officer Commanding-in-Chief, Western Command, Lieut-Gen S. Pattabhiraman, accompanied by his wife, Mrs Lakshmi Pattabhiraman, visited the Paraplegic Rehabilitation Centre, Mohali, yesterday. General Pattabhiraman is also the chief patron of the PRC. 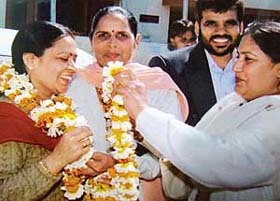 Mrs Manisha Malik, a municipal councillor from Ward No 1 of the Zirakpur Nagar Panchayat, was elected vice-president of the civic body on Friday. Raids are being conducted by the police in Zirakpur, Panchkula and city hotels to nab Jairaj Singh and other unidentified kidnappers of two boys of New Public School here. Jairaj along with six others had kidnapped the boys yesterday to teach them a lesson for harassing former’s sister. Barhka (8), a resident of Mauli Jagran colony was killed after being hit by a scooter near SD School in Sector 24, yesterday. Barkha was playing near the road when she suddenly came to the road and was hit by a scooter (CH01-N-6601) driven by Ashwani Kumar of Janta Colony Sector 25. A Chandigarh Sector 37-C resident Mr Rakesh Bansal died in an accident on the Kalka-Ambala highway at Panchkula T-Point here, late last night. According to the police, Mr Rakesh Bansal was heading towards Chandigarh from Panchkula in his Maruti car (CH-03F-2912) when a truck hit the vehicle from side. The police has booked one person on charges of criminal breach of trust, cheating, trespassing and criminal intimidation. According to the police, Parvinder Singh, a resident of Gurgaon, complained to the police that he had purchased a plot in Sector 71 here from Tejinder Singh in 2003. Here’s your chance to learn the golden rules for preparing great coffee. With Coffee Board, Bangalore, the coffee promotion wing of the Ministry of Commerce and Industry, targetting North India, Chandigarh, will have its first taste of genuinely roasted and brewed coffee making. With just a few days left for the CBSE final examinations to begin, students are burning the midnight oil. The Class XII and X examinations start from March 1 and March 3, respectively. The Punjab Agriculture University Vice-Chancellor Dr K.S. 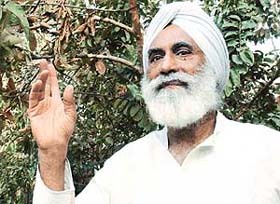 Aulakh, yesterday suggested that Punjab Government should focus on oil seeds and pulses as diversification options. A map quiz was organised at the Survey of India office, Sector 32, here yesterday. The quiz was part of the celebration of National Science Day, 2005. Teams comprising three students each from Chandigarh, Panchkula and Mohali participated in the quiz. Vivek High School, Sector 38, organised song and rhyme show by nursery, LKG and UKG kids, here today. Starting with prayer meeting, the three-year-old sang “Ai Malik Bakshish Kar”. It was followed by a rhyme show, compositions on Barish, Aaloo bola and Hathi Raja. A two-day festival, Shor, of the Northern India Institute of Fashion Technology concluded with the prize distribution function here this evening. A number of competitions like collage making, nail painting, rangoli, face painting, clay modelling, tattoo making, hair styling, etc were organised as part of the festival. A two day seminar on ‘Preparation of glossary of technical terminology’ organised by the National Commission for Scientific and Technical Terminology, New Delhi, in collaboration with the Haryana Sahitya Akademi concluded at the Press Club here today. The management of the DAV School, Sector 15, today announced to introduce co-education at the senior secondary level in the school. The provisional admission to the Classes XI and XII in different streams would begin from March 22, said the Principal of the school, Ms Rakesh Sachdeva. A book on ‘ Architectural Aesthetics’ written by Sangeet Sharma was released by Ms Sarla Vijayan, Editor of Indian Architect and Builder, at a function organised by the Chandigarh and Punjab chapter of the Indian Institute of Architects at Chandigarh College of Architecture here today. A local court today sent the Ludhiana-based couple — Surjit Singh and Sharanjit Kaur — to two days in police remand. They were arrested by the Panchkula police from Ludhiana yesterday and brought here in a case of defrauding a local resident of Rs 5 lakh, on the pretext of sending him abroad. Mr Rajdeep Singh Tacoria was elected unanimously as chairman of the Bar Council of Punjab and Haryana here today. According to Mr Ram Mohan Singh, secretary, Mr Sukhdeep Singh Bhinder, was elected as vice-chairman at a meeting of the council here. Sabhyacharak mela, Mubarkan — 2005, was organised by the Punjab Lok Kala Kendra in Phase VIII here today. It was inaugurated by Mr Harbans Lal, Chief Parliamentary Secretary, Punjab. The show started with a presentation by Dhadi Balihar Singh Dhindsa and party. The Punjabi Natak Academy will stage four plays, related to Sikh centenaries, in Bangkok from March 1. Mr Charan Singh Sindhra, general secretary of the academy, said here that a 16-member team of artistes would be leaving for Thailand tomorrow. Wish we had a little more of gorgeous Kareena, a shade more of seasoned Anil Kapoor and we would have been floored! What else do you expect when we have an effervescent Kareena who renews herself, looking so fresh that you think that she is very happy with the world. Yet here she is dithering as a dutiful mother, fulfilling her responsibilities , bearing the pain of a schizophrenic woman torn between love and baggage of responsibilities. “Life is a caravan of humanity moving on in an unsaid symmetry. People move one holding onto their pots and pans, children and pets, gains and losses. The artist among them is the one who has the courage to step out of the caravan, stand at a vantage point and see whence the caravan came from and whence it is going,” said the noted sculptor Avtarjeet Dhanjal in an interview in Chandigarh on Saturday evening. The PGI Campus Residents Welfare Society urged the UT Administrator Gen S. F. Rodrigues (retd) yesterday to include the PGI campus under the municipal corporation limits for its development. The India-Pakistan Test series can evoke passions and it was evident today. 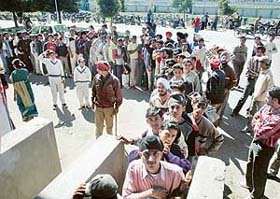 Cricket fans were seen waiting for hours as the sale of tickets for Indo-Pak test series started today. Match at the Punjab Cricket Stadium, starts will on March 8. As many as 30 previous meet’s records were broken by Yadavindrians on the penultimate day of the annual athletics meet of Yadavindra Public School here today. A superb opening partnership of 80 runs between Deepak Saini and Harpreet Singh enabled Satluj Cricket Club beat Bedi Cricket Club by 80 runs and enter the semi-final of the Amartex Cricket Cup at the JR Institute of Cricket Technology grounds, Barwala, near here, today. Kiran Negi was adjudged the best athlete in the concluding ceremony of 37th annual sports meet of MCM DAV College for Women, Sector 36, here today. The ceremony opened with marchpast and yoga demonstration. Chief guest S.K. Sandhu, Finance Secretary, Chandigarh, took the salute and gave away the prizes to the winners. Achievements of golf queen Irina Brar were mentioned.